Posted on: February 11th, 2014	by Jennifer A. Do you have any ideas for making Valentine’s Day extra special for your kids? We’ve got some ideas but we’d also love to hear yours. If you’d like to share please comment below. 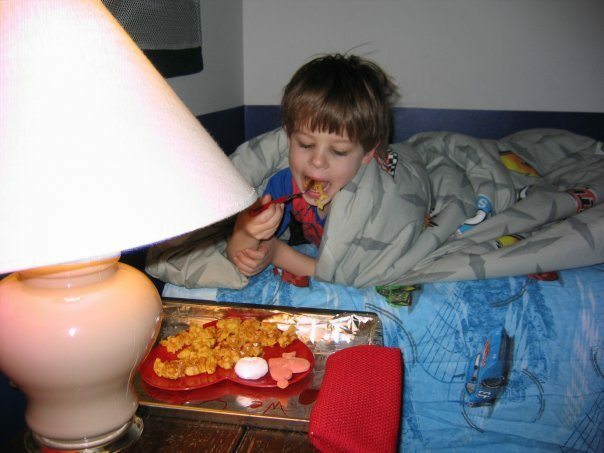 Start one day with surprising your child by showing up in their bedroom with their favorite breakfast? (I’m going to have to get up real early.) I’d avoid the cereal to avoid spills, but pancakes, waffles, and toast should all be eatable in bed. Use a heart-shaped cookie cutter to create heart pancakes, waffles, etc. Add red food coloring to the food and drinks to add to the special meal. Give the meals special names: Love Potion for the drink, Heart Cakes for pancakes, Cupid’s Crunch for waffles. Serve the meal up on red heart-shaped plates and drink from red cups. And don’t forget to include a special homemade Valentine’s Day Card. Serve on a tray decorated with hearts and your child will just feel the love. Caution, though, your child may experience random bursts of enthusiasm. You could follow up breakfast by having your children come into their playarea. Give it a Valentine makeover by fully decorating it with red balloons. Hang up hearts with messages listing the reasons you love them or perhaps photos of your special memories with them. Then, spend some time letting them be in charge. What games do they want to play? What toys are their favorites? Is there a special place your children like to go? Do they like the park, the movies, roller skating? Take them out to their favorite spot. Perhaps they’d enjoy a movie. Your day out could also include visiting others your children love and showering others with love and Valentine cards. And make sure you hold hands, Valentines always hold hands.